Let’s Add “Healthy Whole Grains” to EVERYTHING! Georgene just showed me a article in the Smithsonian Magazine that made me physically ill. 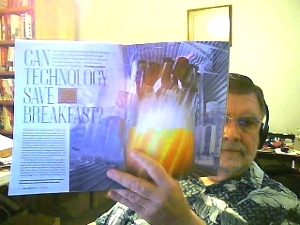 The title is “Can Technology Save Breakfast?“. The link is to the web article; we get the print edition. As my friend Tom Naughton would say: HEAD. BANG. ON. DESK. Like all professional food people, I have food peculiarities. One is that I am incapable of keeping a box of dry cereal in my cupboard without consuming it in a very short period—say, before daybreak. 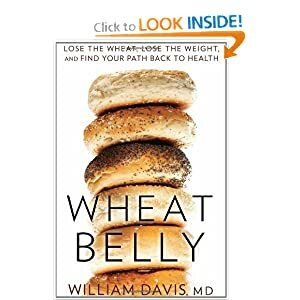 Anyone who had read Dr. Davis‘ Wheat Belly (Kindle edition) knows that only reason for the addition of wheat to any food is to take advantage of the appetite-stimulating action of gliadin and amylopectin-A, which makes people want to eat more, and therefore buy more of that product. Which, in turn, increases the profits of the outfit selling the stuff. Call to action: Here is the Smithsonian feedback link. You know what to do. You can also post a comment on the article itself. If you leave feedback there, or post a comment to the article, please leave a comment below indicating that you did so, just in case the moderation policy at the Smithsonian includes deleting anything short of glowing praise for this drivel. This entry was posted in Book Reviews, Diet, Health, Nutritional Research and tagged Agriculture, Cereals, Corby Kummer, General Motors, Lausanne, Smithsonian, Tom Naughton, Wheat. Bookmark the permalink. 1 Response to Let’s Add “Healthy Whole Grains” to EVERYTHING! This is a really creepy article. Yes, they did publish my comment, which I didn’t make as long as I would have liked as (probably my computer bad) it took about 10 minutes just to get those keystrokes in. Maybe they didn’t want any journalist showing up who could really get a grasp of what they were doing?